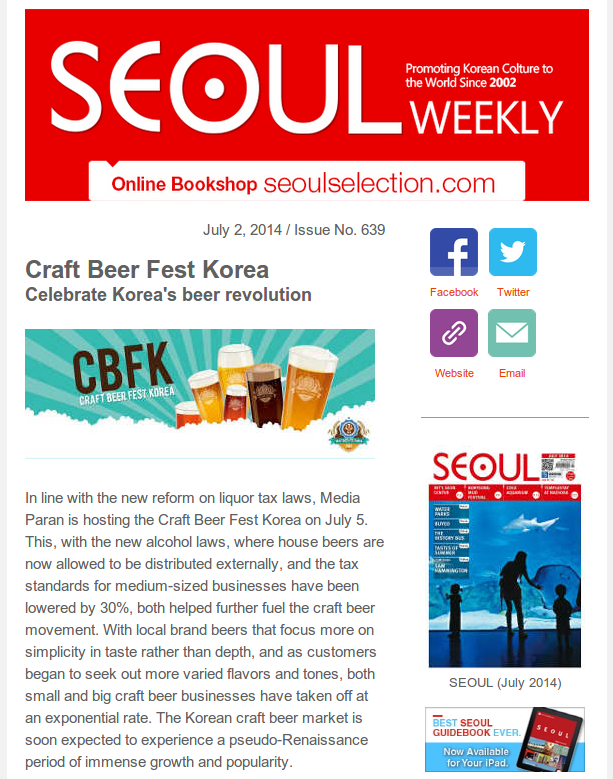 In line with the new reform on liquor tax laws, Media Paran is hosting the Craft Beer Fest Korea on July 5. This, with the new alcohol laws, where house beers are now allowed to be distributed externally, and the tax standards for medium-sized businesses have been lowered by 30%, both helped further fuel the craft beer movement. With local brand beers that focus more on simplicity in taste rather than depth, and as customers began to seek out more varied flavors and tones, both small and big craft beer businesses have taken off at an exponential rate. The Korean craft beer market is soon expected to experience a pseudo-Renaissance period of immense growth and popularity. Craft Beer Fest Korea will be held at Dukeâs, located near the War Memorial Museum in Yongsan-gu, the center location of the craft beer movement. The fest will feature 24 locally crafted beers, with pizza and snacks to munch on. From stencil tattoo of the event logo to live bands, this will be an exciting outdoor event. What doesn’t Psy’s new song tell us about Korea’s drinking culture? What city in the world has the most Starbucks? Like you needed to ask. The Kansong Museum’s treasures on display at DDP. The pope wants only a modest car for his upcoming visit to Korea. Kim Sungjin captures Hadong from above. The beautiful island of Sejon-do. Another week in my life. Please come and enjoy the “Night Bazaar” seafood feast every Saturday at Granum Dining Lounge. Meet a variety of fresh seafood and fish that are caught by Banyan Tree associates. The fish will be displayed on ice wooden boxes so you can watch and pick what you like, and will be cooked and directly delivered to your table. Enjoy the exotic taste of “Night Bazaar,” a seafood feast especially for the summer season. The Orchestre de la Suisse Romande (OSR) literally translates to the “Orchestra of French-Speaking Switzerland,” and was founded in 1918 by Swiss conductor Ernest Alexandre Ansermet, a mathematics professor who later turned to conducting. Currently consisting of 112 world-class musicians, it has been led since September 2012 by Artistic and Musical Director Neeme Jarvi, a conductor from Estonia, with Kazuki Yamada as the orchestra’s principal guest conductor. Although born in Germany, Clara Jumi Kang is one of Korea’s most revered violinists, another one of those extremely gifted prodigies who start their musical career at a young age—three years old, to be exact. She was accepted into the Juilliard School with a full scholarship at age seven. She went onto to perform with orchestras such as the Leipzig Gewandthaus, Hamburg Symphony, Kiel Philharmonie, Nice Philharmonie, Atlanta Symphony, Seoul Philharmonic, KBS Orchestra, Korean Chamber Ensemble and more. However, an unfortunate finger accident at age eleven halted her performance career for over four years, a hiatus she used to acquire her Bachelor’s and Master degree at the Korean National University of Arts. After returning to the stage, she continued to dazzle audiences and critics, winning several fans and awards along the way. Be sure to pay special attention to her performance of Tchaikovsky’s Violin Concerto. GETTING THERE: Nambu Bus Terminal Station ë¨ë¶í°ë¯¸ëì­ (Line 3), Exit 5. Transfer to shuttle bus or green bus No. 4429. Based on the classic 1933 movie musical of the same name, 42nd Street tells the story of Peggy Sawyer, a small-town girl with starry eyes and big dreams who comes to Broadway to fulfill her lifelong ambition to become a star. Things are hard at first, for Peggy loses her first chance to audition because she can’t work up the nerve to walk onstage until the audition is over. In a fortunate turn of events, however, Peggy manages to catch the attention of the director, who casts Peggy when he turns up one chorus girl short. 42nd Street opened at the Winter Garden Theatre on August 25, 1980, and has since become one of the world’s most popular musicals, especially in Korea, where show after show never fails to turn out packed houses of eager audiences. It has also been nominated for several Tony Awards, including Best Revival in 2001. As of this year, 42nd Street is the fourteenth longest-running show in Broadway history. Horses, archers, wrestlers, steppes, deserts, ancient ruins, monasteries and more await you on this exciting excursion. RAS is offering this overseas excursion after a hiatus of several years. It is timed to coincide with Mongoliaâs National Day and the opening of the main Naadam festival. This is a unique opportunity to discover a beautiful country whose history has been closely linked with that of Korea for centuries past. Dongdaemunâs fabric market is a five story building organized into four quadrants. The tour guide will help you navigate through the labyrinth of fabrics, notions, craft materials, buttons, upholstery, sewing services and more. Dongdaemun Market opened in July 1905 in Yeji-dong, the literal meaning being âa neighborhood for learning politeness,â so the market was originally called Baeugaejang meaning âmarket for learning.â The Dongdaemun area has been enlarged over the years, and in 1998–1999, large shopping malls were built in the district and the market was renovated with a modern atmosphere among the traditional market. 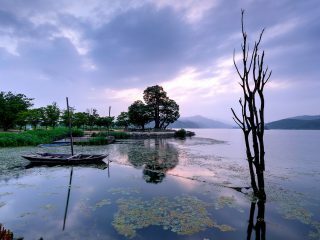 Thus this area became the largest of its kind in Asia. In 1985, a new wing was added to the fabric market section of the Dongdaemun Shopping Town. This area now encompasses five buildings divided into A, B, C, D and the Shopping Town. There are over 5,000 shops located in this district, offering everything and anything related to textile material. 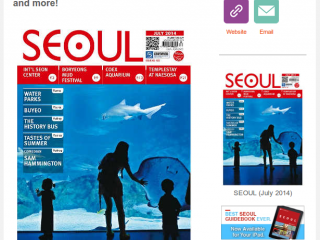 The group will have lunch during the tour in the one of the Dongdaemun buildings. COST: SIWA members: KRW 5,000; non-SIWA members: KRW 15,000. Lunch paid individually. Sunrise at Yangsu-ri, Yangpyeong, Gyeonggi-do. Photographed by Robert Koehler.